Loyal was so named because of the patriotic nature of the men of the pioneer town who went off to protect the Union during the Civil War in the 1860s. 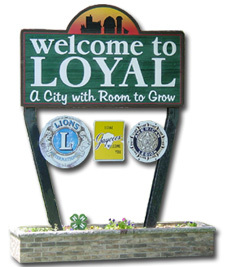 Loyal was established in 1870. Logging and pioneer farming brought settlers to the area that is now well known for its productive land use and dairy heritage, and serve as a hub of a large agricultural area. Loyal has three City parks. The West Side Community Park has two baseball fields, a small golf course, volleyball court and a sheltered pavilion for family outings. The park is also home to a Veterans Memorial honoring its war veterans. It was inspired by the 2001-2002 eighth grade class, and funded bu the sale of engraved memorial bricks. The City may be best known for its annual August Corn Fest. It features Spanky's 5 and 10K run/walk, free corn on the cob, and evening truck and tractor pull and a Sundy parade down Main Street. September features a classic car show.